Although it was activated on April Fools’ Day—1 April 1966, to be precise—the mission with which 1st Signal Brigade was tasked was no laughing matter. 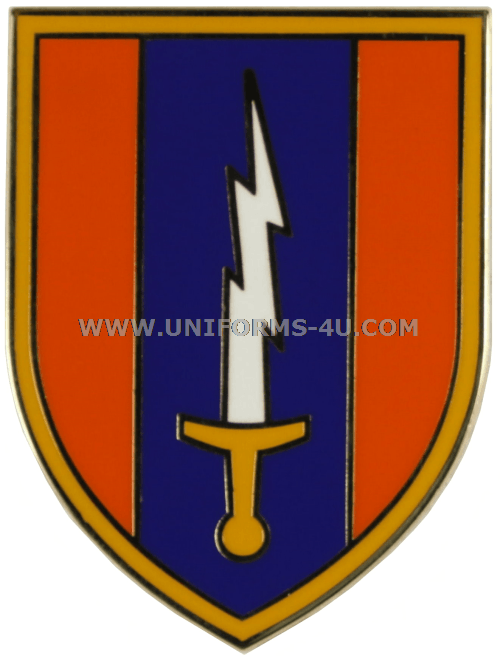 The three existing signal groups that were merged to form the brigade had to design, install, operate, and maintain a communication system that melded all existing tactical and strategic communications in Southeast Asia, placing them under a sole, unified command. At the height of the conflict, the brigade consisted of six Signal groups and 22 Signal battalions comprising more than 22,000 soldiers. But the drawdown leading up to the signing of the Paris Peace Accords left the brigade with fewer than 1,300 personnel by November 1972, at which point it was relocated to the Republic of Korea and placed under the U.S. Army Strategic Communications Command. Its mission is to provide communications support to U.S. Forces Korea, the Eighth United States Army, and United Nations Command, as well as operate and maintain the Defense Communications System. Both the Combat Service ID Badge and the brigade’s Unit Crest (Distinctive Unit Insignia) feature a sole lightning bolt—a symbol of communication and the unit’s numerical designation.